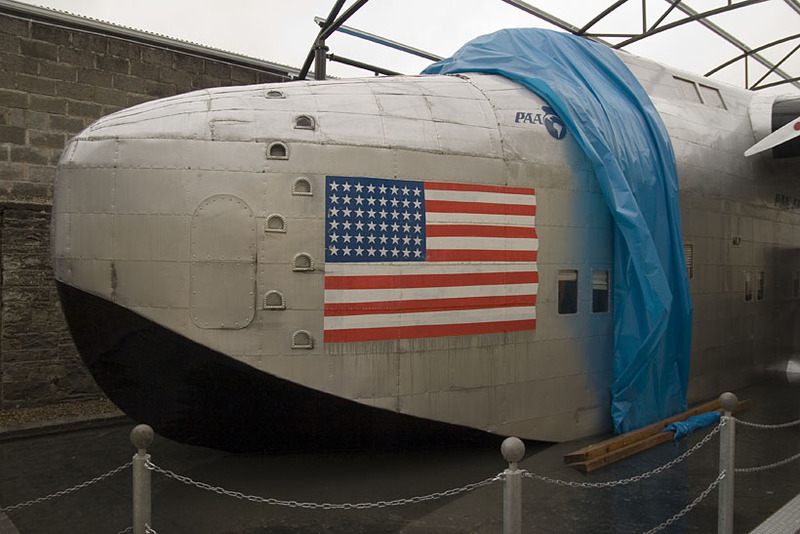 During a short family holiday in Ireland, I wondered what vintage aviation history I could find here; while planning my circle route, starting and ending in Cork, I stumbled on Foynes... the Flying Boat Museum to be exact! 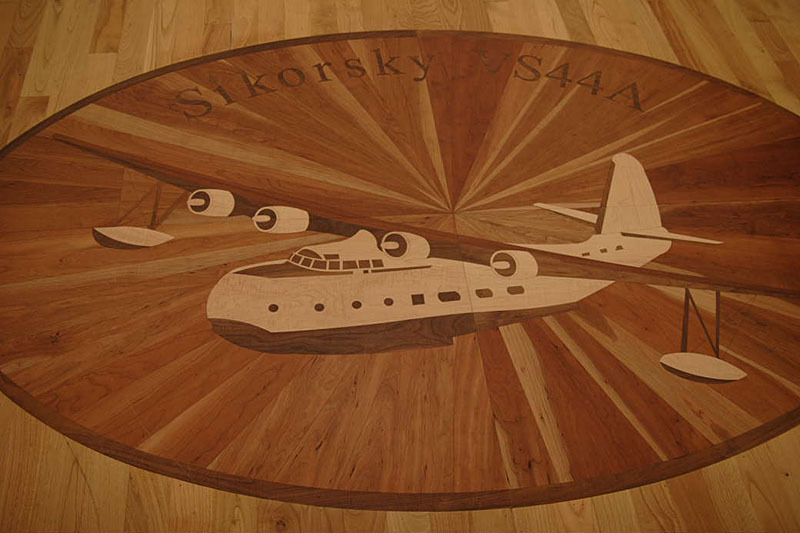 The museum is a little treasure, with much care about details but what about this artist impression of the Sikorsky S-44 in the floor..! Igor I. Sikorsky's VS-44A was a large transport aircraft with a wingspan of 124 feet, an overall length of about 80 feet and a gross weight of 57,500 pounds. 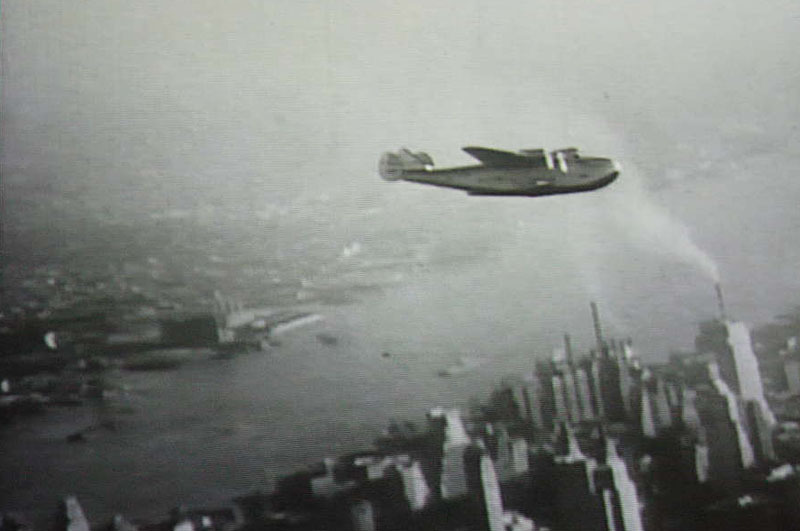 It was powered by four Pratt & Whitney Twin-Wasp radial engines, producing a combined 4,800 horsepower for take-off and a cruise speed of about 210 miles per hour. 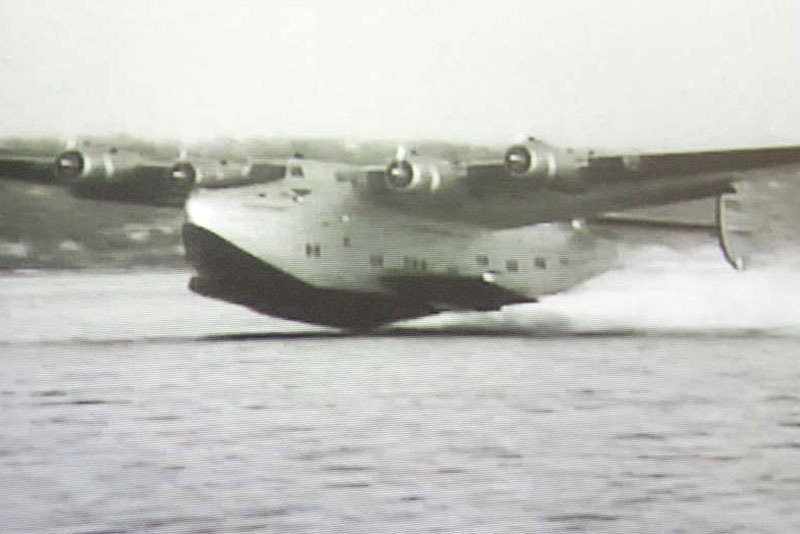 The nonstop range, depending on load and the quantity of fuel, was approximately 4,000 miles, which was unmatched performance for the time. 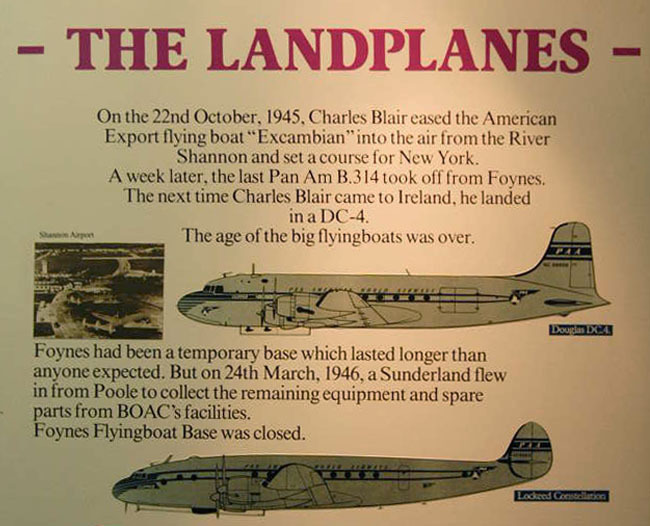 The aircraft on display here is a replica, built to honour these aircraft and those few years in which Foynes appeared in the limelight of World Aviation News. 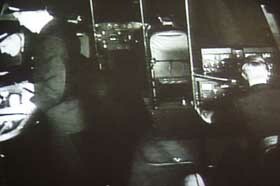 The photo on the right is a close up of the copilot's position. 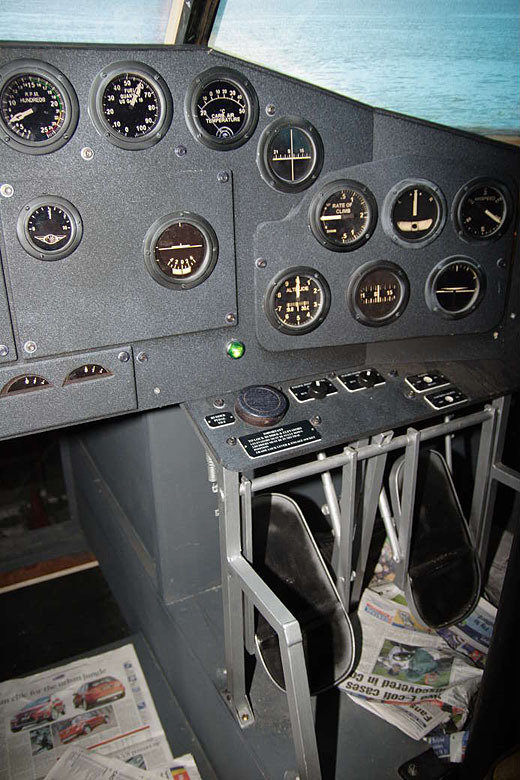 All the pilots had to do was the steering of the plane: throttles, monitoring fuelflow, navigation... al done by the staff immediately behind them. 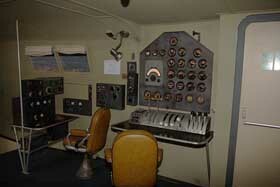 The cockpit was a huge place compared with the confined workoffice flightcrew find themselves in these days! 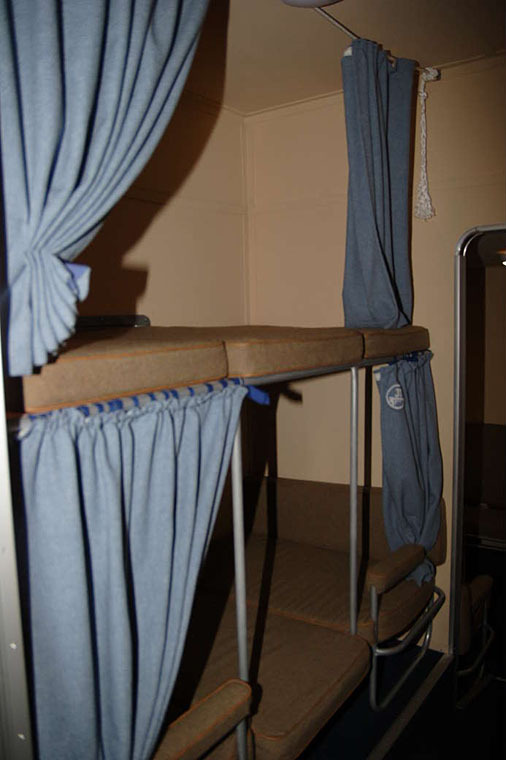 And passengers had much more space than the 'cattle class' we have to enjoy in airtravel, too! Mind, the people travelling in those days were only the 'upper class', days of economy travel were far away in the future. 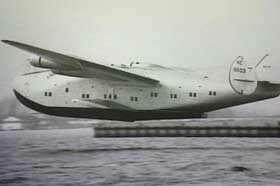 A huge plane like this, with 40 passengers, was a big step towards mass transport. But compare 40 passengers to the 400 in the Boeing 747 and compare the size again! 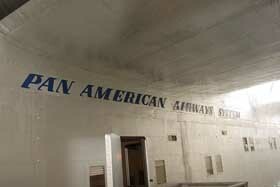 Pan American and the American aviation industry was the driving force in developing the planes of this size, and the range of course. The museum is housed in the original old terminal building, which was formerly the Monteagle Arms Hotel. 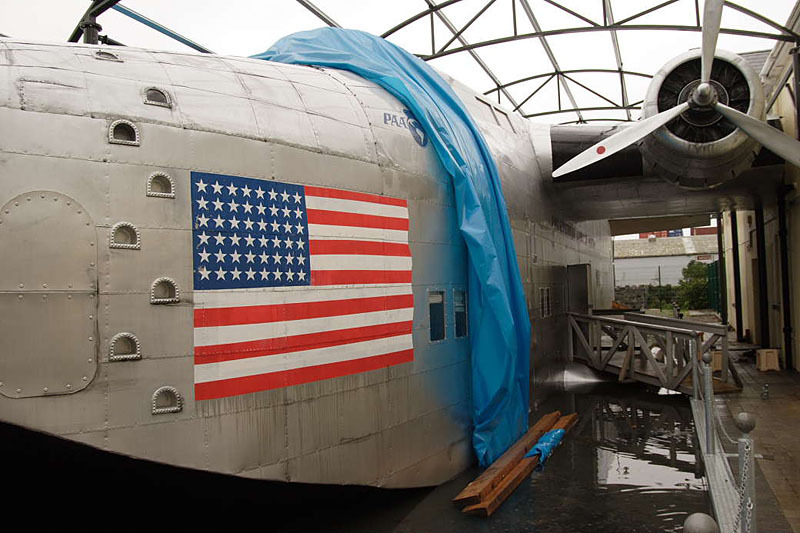 Lindbergh, famous for his Trans Atlantic crossing, was sent by Juan Trippe of Pan Am to find suitable locations to land his big Flying Boats, and it was Lindbergh who recommended this spot on the river Shannon: Foynes. 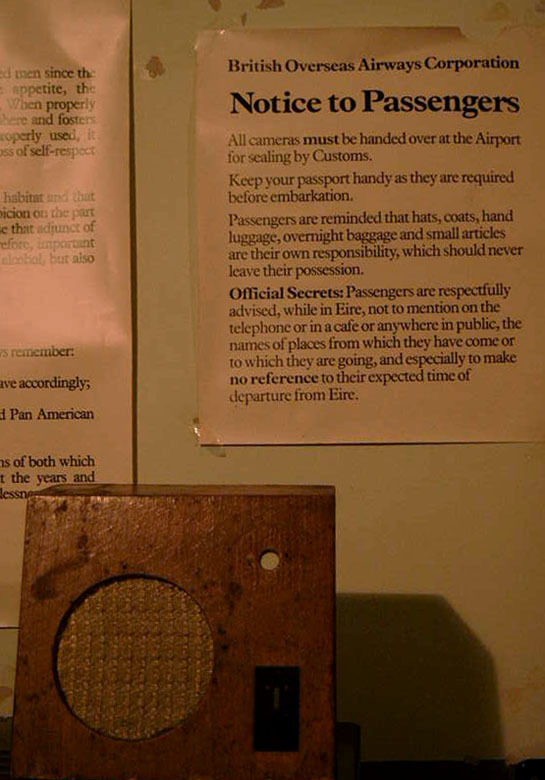 Before schedules could be fully developed, however, World War 2 broke out; this led to instructions to passengers such as the one posted on the right. 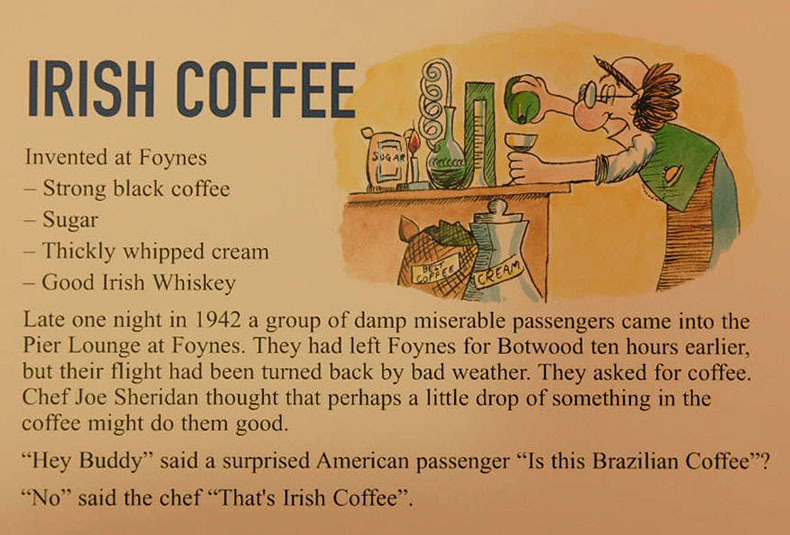 "I was interested in your item about flying boats operating out of Foynes. 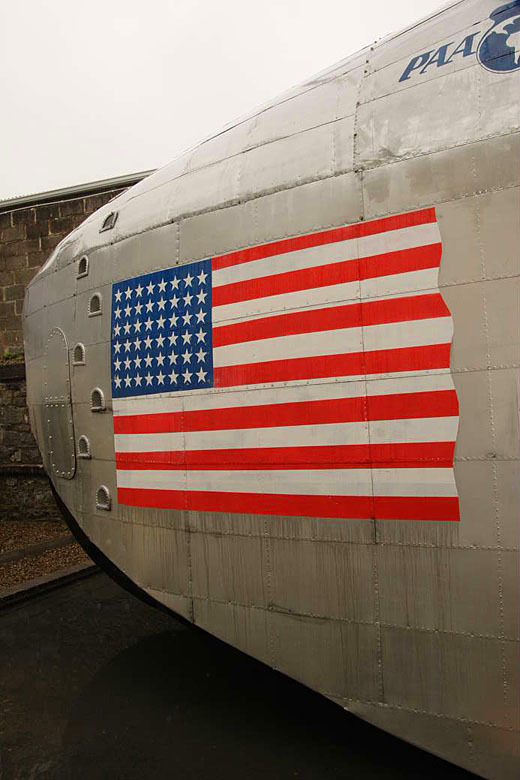 I visited Foynes myself in 2007 and also visited the museum. It brought back memories of my relief work with the Royal Mail during the mid-1950s. I used to work in Cowes on the Isle of Wight and used to walk along a road lined with mothballed Saunders Roe flying boats, which used to be constructed at East Cowes. They flew in and out of the Solent and River Medina. 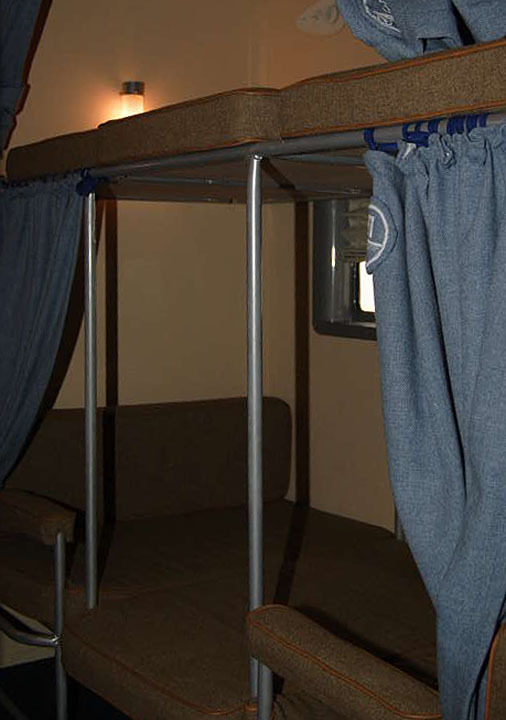 I happened to be present one day when a party of US Navy top brass visited the SRs and one in particular was opened up, the cocoon I mean. 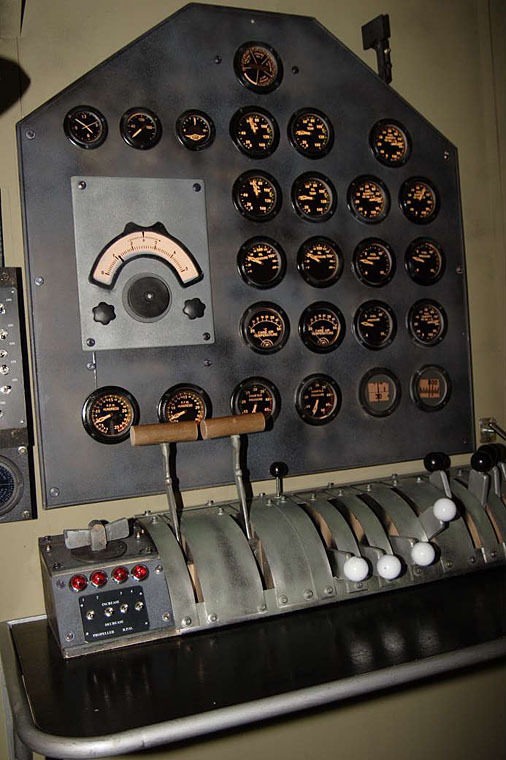 I learned later that the US Government was at the time seeking a strong enough test bed for a nuclear aero engine, and I happened to be present when the navy men and scientists made their inspection. The SR was turned down and I never heard anything more of the project." 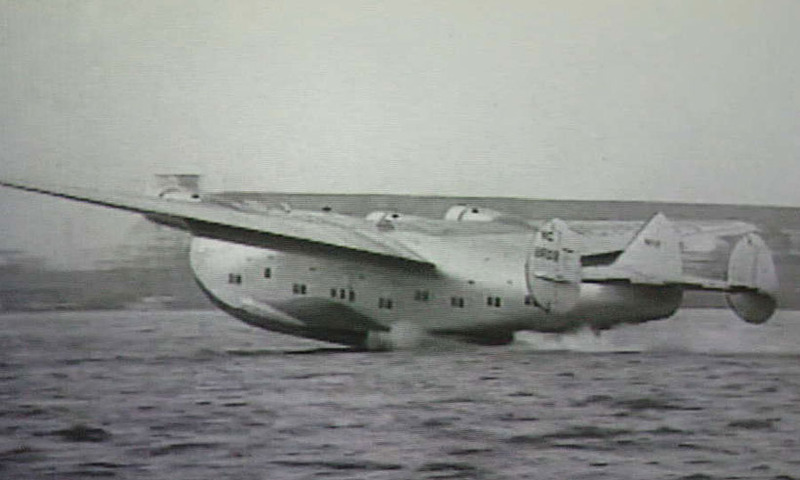 Besides a lot of information on display, a movie is run which shows the fast evolution of the use of Trans Atlantic operations with these flying boats. I managed to shoot a few photos, to illustrate this exciting -though short-lived- moment in commercial aviation history. 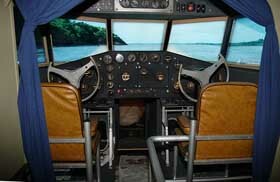 In the summer of 1940 American Export Airline ordered three Sikorsky S-44's, at a total cost of $2,100,000. 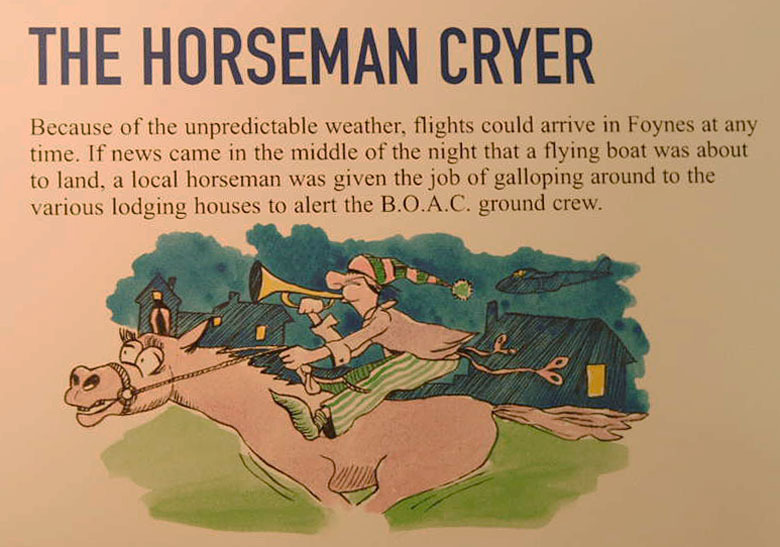 These aircraft were dubbed the "Flying Aces" by AEA . 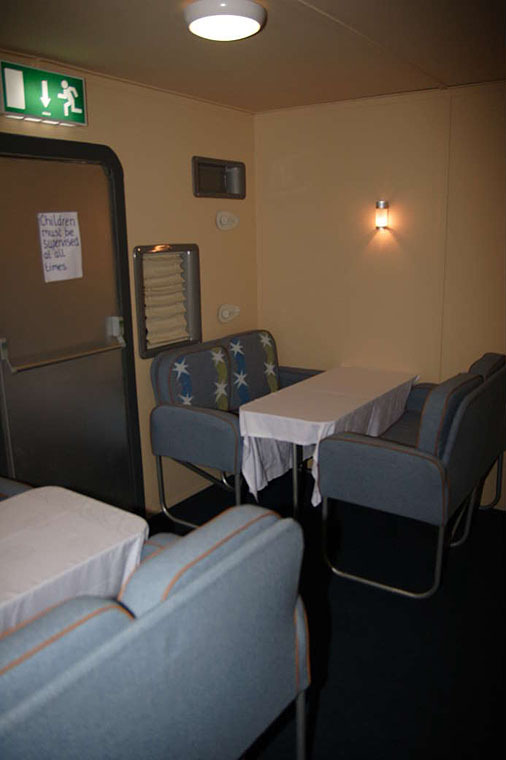 Its advertising boasted minimum vibration, maximum sound-proofing, individual sofas, full length beds, roomy dressing rooms, full galley for serving hot meals, snack bar service, attractive lounge and smoking room, proper heating and ventilation and more square foot area per passenger. 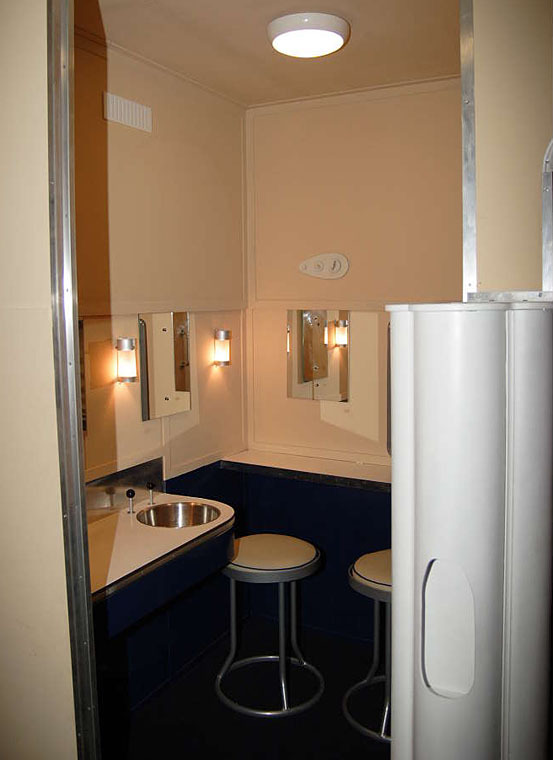 No other contemporary aircraft had these luxuries. 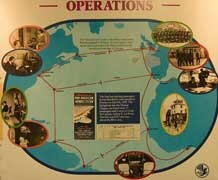 AEA signed a contract with the Naval Air Transport Service to operate a wartime trans-Atlantic route in January, 1942. 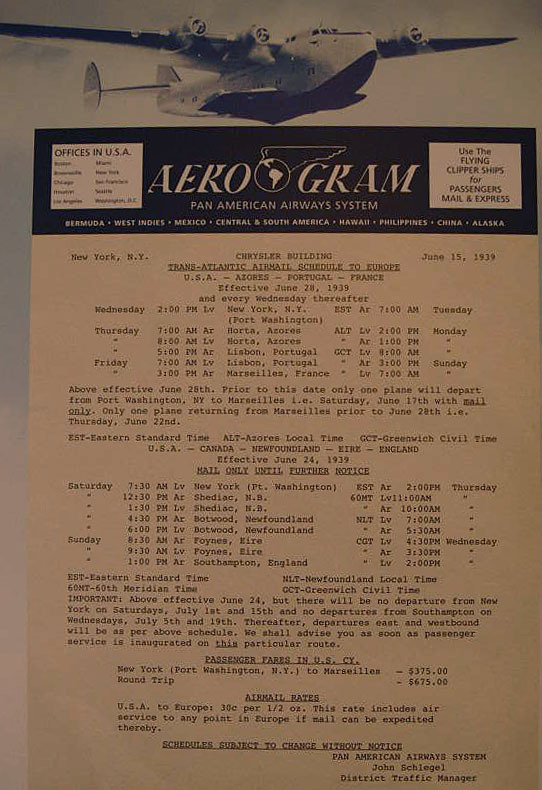 On May 26 the Excalibur made the maiden nonstop flight from New York to Foynes, Ireland and on June 20 regular round trip service began. 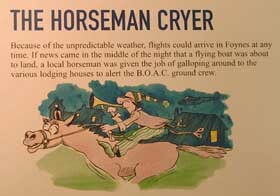 The Flying Aces proved to be the world's longest range airliners and set record after record. 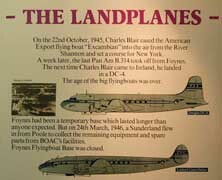 They were the only aircraft capable of flying nonstop across the North and South Atlantic at full payload in excess of 3,100 miles. 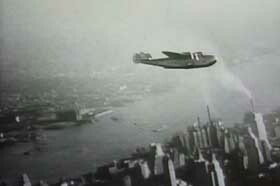 Designed for the airlines, Igor Sikorsky's S-40 American Clipper was flown in 1931. The bigger, more efficient S-42 Clipper flown in 1934 was used by Pan American to open routes across the Pacific and Northern Atlantic. 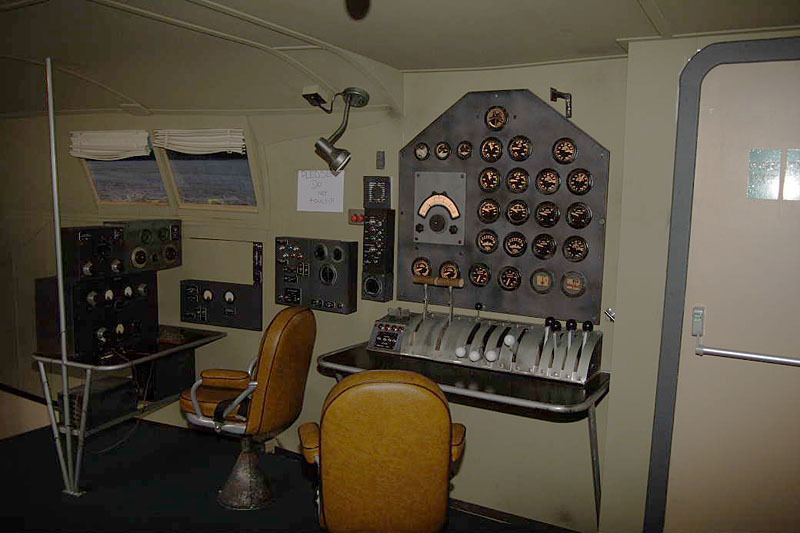 The smaller S-43 found success on shorter routes. 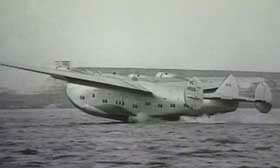 The Sikorsky line of flying boats culminated in the long-ranged VS-44A Excalibur with seats for 40 passengers. Operations also called for stationing many ships along the route, to provide weather information and in case an emergency required ditching the airplane on open sea. A good book to learn more of this: "Cleared for Disaster" (subtitled Ireland's most horrific air crashes), by Michael O'Toole (Mercier Press, 2006) as it not merely provides an analysis of air crashes, but many of the chapters describe aviation in wider detail. So 'landplanes' took over trans-atlantic air travel after WW2, making use of airports developed during the war, such as Gander and Goose Bay and while 'second-tier' companies operated these humongous flying boats for a few years after WW2, their role was soon over. 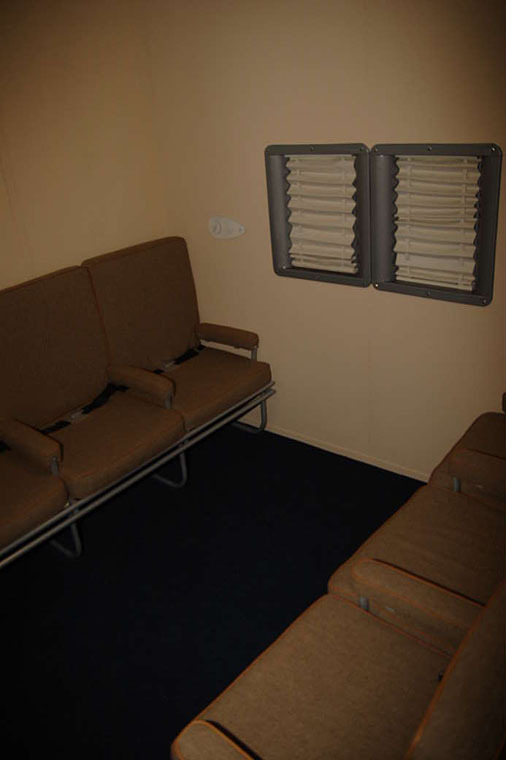 Sad to find that replica's have to be used to commemmorate this stage of air travel. 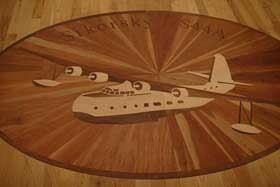 "Don't mean to be excessively picky, but you have emphasized the Sikorsky boats in your webpage.... 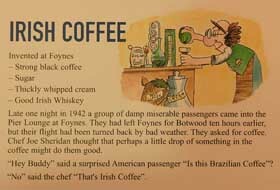 While they were used initially for 'proof' flights, it was the Boeing boats that made the first commercial passenger flights, and all subsequent wartime flights as well; you have two photos of the Boeings on takeoff in your page, but the text only mentions Sikorsky's various models! 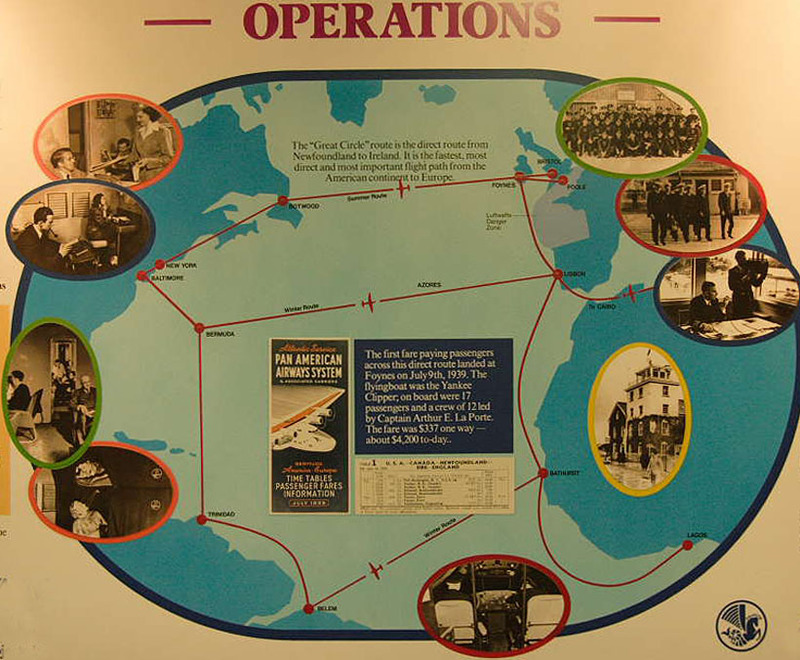 Incidentally, the Yankee Clippers also flew to Lisbon and Marseilles, which I believe was the Easternmost terminal for Pan Am. Marseilles installed night 'runway' lighting in the harbor..... the lights were several feet underwater, outlining the 'runway' (so to speak), and worked well. Btw, the original Pan Am New York terminal was at Port Washington on Long Island: nothing left there now.... Later moved to LaGuardia airport where a special terminal was built for flying boats (which landed in the East River where it meets Long Island Sound). Still called the Marine Terminal I believe."